Go back in time to the era of classic safari – stay for five nights at any combination of selected lodges in Kenya and Tanzania, and only pay for four! Entice your senses at the beautiful Ngorongoro Crater Lodge, swirling in the mists of the Ngorongoro Crater, and explore the wildlife wonderland on the crater floor. Follow the movements of the Great Migration as huge herds of wildebeest and zebra move in search of lush grazing at the mobile tented camps of Serengeti Under Canvas. 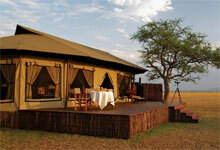 Experience the safari adventure of a lifetime in the “spotted land” of the Masai Mara at Bateleur Camp. Sanctuary Swala is located in an exceptionally private section of Tarangire National Park, offering visitors a luxurious and very exclusive safari experience. The camp, which has twelve tents, has recently been completely rebuilt to the highest eco-friendly standards.Sanctuary Kusini is the only permanent tented camp in the southern Serengeti and provides extraordinary views of the plains below. 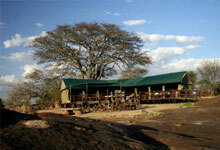 Set on a rocky outcrop, or kopje, the twelve tented bush camp is so remote that it needs its own airstrip. Sanctuary Swala is located in an exceptionally private section of Tarangire National Park, offering visitors a luxurious and very exclusive safari experience, perfect for honeymooners. 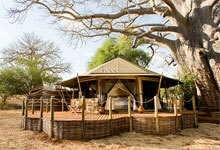 The camp, which has twelve tents, has recently been completely rebuilt to the highest eco-friendly standards. The main dining area, deck and library which are lifted on stilts around an enormous and ancient baobab tree are complimented by a stunning infinity swimming pool overlooking the water hole. Soak up the untouched wilderness of Singita Grumeti Reserves and enjoy the luxury of two of the classic Singita Grumeti Safari Camps, located in northern Tanzania. 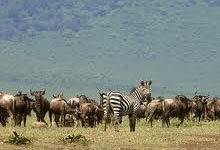 This reserve forms part of the Serengeti-Mara ecosystem, on the western corridor of the Serengeti National Park – Africa’s No. 1 World Heritage Site. The word ‘Serengeti’ comes from the Masai word ‘Siringit’, which means ’the place where the land stretches to forever.” The famous Great Migration, an annual trek of 2 million animals through the Serengeti-Mara ecosystem, bisects this reserve annually. Called The Greatest Wildlife Show on Earth it has, since time immemorial, been the dramatic backbone of this enormous wilderness. 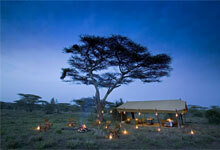 Reminiscent of a bygone era, Sabora Tented Camp dishes up lavish doses of romance, exploration and intrigue. Creating the feel of a lavish tent, each canvas cocoon offers opulent luxury complete with antique mahogany travel chests, Persian rugs and silk curtains. 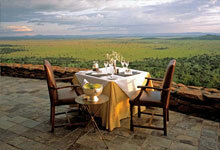 Sip sundowners on the deck and gaze over the waterhole – you never know what you might see. At Sabora, enjoy delicious feasts cooked using locally grown organic produce, coupled with vintage wines, in surprise settings. Imagine dining beneath a lamp-lit acacia or under the boughs of a large ‘Sausage’ tree, with starlit skies and the distant chorus of nocturnal creatures. * 5 nights luxurious all suite accommodation, breakfast, lunch and dinner daily, teas and coffees. * A choice of gift to the value of US$75 from The Singita Shop. * Private dinner beneath the stars.